Procedure: Preheat the oven to 350°F. Beat the butter, granulated sugar, vanilla extract and a pinch of salt with a electric mixer on medium speed until creamy. Beat in the eggs, one at a time, adding 1 tbsp cornstarch with each addition. Stir in the remaining cornstarch, flour and baking powder. Grease and flour a 10 inch spring form pan. Spoon in the batter. 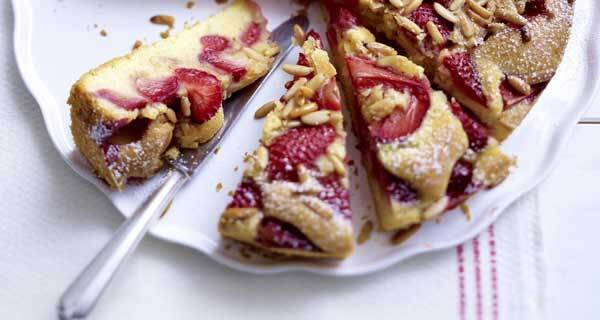 Sprinkle with the strawberries, pine nuts and brown sugar. Bake for 40-50 mins. Cover with foil during 10 mins if the top is becoming too brown. Cool in the pan on a wire rack. Remove from the pan. Sprinkle with powdered sugar and serve with whipped cream, if desired.